This issue's article is an article by Manu Joseph and was printed by the Times News Network in India on October 23rd 2004. MUMBAI: The 16 sutras of Vedic maths spell out astonishing techniques to multiply, although in an arithmetical sense. They have been rediscovered by an improbable breed - a youthful India whose road to the material world inescapably passes through nasty entrance exams. While quantitative ability may not build a nation, it is a special Indian talent that cracks some of the toughest entrance exams in the world like the IIMs ' Common Admission Test and the IITs' Joint Entrance Exam. But, just two to five per cent of the hordes who write such tests ever make it. With every candidate being severely trained for months and even years to face the entrance tests, there is a ceaseless hunt for a winning edge, any trick that would save computation time. It is this desperation that has ressurrected the magical short cuts of Vedic Mathematics - a set of cryptic Sanskrit verses rumoured to be part of the Atharvaveda, though the real origins are vehemently contested. Prashant Chopra is a 20-year old without the advantages of genius. But when he is asked the square of 109, he answers in less than a second, "11881". Chopra has used an intepretation of a Sanskrit verse, according to which, if he wants to find the product of two numbers that are close to one hundred, all he has to do is add one of the numbers to the last digit of the second one. In the case of the square of 109, this would mean 109 + 9 or 118. The next step is to attach the product of the last two digits; in the above case, 9 X 9 = 81. That's how he arrived at 11881. "In a two-hour CAT exam," he says, "I will save 10 minutes by using Vedic maths." He is one of the nearly 130,000 candidates who will take CAT this year in a battle for about 1,300 seats. The usefulness of Vedic maths for MBA and even engineering entrance exams, is spawning a growing industry. Three-day workshops are being oversubscribed. Books on the subject are selling as though they are steamy romances. 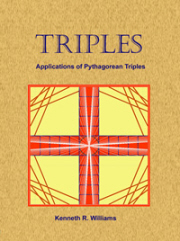 Tirthaji Maharaj's Vedic Mathematics has sold nearly 40,000 copies this year. RP Jain, a director of the book's publisher, Motilal Banarsidass says, "The book was our best seller this year." Teachers are mushrooming across the country. Delhi-based Pradeep Kumar, an alumnus of IIM, runs a centre called Magical Methods that trains over 600 students in Vedic maths and charges them Rs 1,650 to Rs 3,500 for correspondence and one-month classroom courses. He says, "When students enroll, we give them three objective-type tests of varying difficulties. Before they learn Vedic maths, the average time they take is nine to ten minutes, they attempt 90 per cent of the questions and the average correct answer ratio is 78 per cent. After 16 hours of learning Vedic Maths, they finish the papers in 2 to 3 minutes, attempt all the questions and get 98 percent right". He grosses Rs. 1.5 crore a year. "The way things are going," he says, "I think the figure will be Rs 10 crore in less than two years". Children under 10 too are learning Vedic maths. Their parents, who know that it is in the fate of the Indian middle class to face entrance exams, are introducing them early to this quaint maths. Rajeshwari Sharma, a teacher based in Mumbai, takes Sunday lessons for such kids. "They really love it because it's like magic," she says. "One boy even told me, 'It's like a big piece of cake'." Even the President of India pushed away the strands of silver hair from his eyes and wrote a letter to Sharma praising her book, A Handbook on Vedic Mathematics . "Particularly I liked Chapter four - Square Root (Vargamoola)," he said. The return of Vedic maths is evident but there is this question of where exactly it returned from. Though the computational system is widely believed or perceived to be from ancient Vedic scriptures, there is no visible evidence to support that claim. In the 1960s, Tirthaji Maharaj, who was the Shankaracharya of Puri at that time, said that he had found some verses in the Atharvaveda that led to astonishing methods of calculations. It was he who wrote the first compilation that came to be called Vedic mathematics. Not everybody believes that the seer, who himself had a strong background in maths, had indeed found an old treasure. The material that the holy man claimed was part of the Vedas was a set of 16 cryptic Sanskrit verses that could mean anything. For example, one of the "formulae" is Ekadhikena Purvena. When translated, it simply means, "By one more than the previous one". But Tirtha Maharaj interpreted it in various ways and formed entertaining methods of easy multiplication. The entire Sanskrit text of what is called Vedic maths is not more than fifty words. "It is a mystery how people do not notice such simple things," says SG Dani, a professor at the Tata Institute of Fundamental Research who believes that the whole saleable system of Vedic Maths is in reality just a set of interpretations of one man. Dani once said in a public letter signed by several noted academics, that Vedic Maths is, "neither Vedic nor maths". But whatever be its origins, nobody denies that the Shankaracharya is saving boys and girls a lot of time in their CAT practice tests. They may not escape the endless cycle of rebirths but may escape the cycle of retests. Three Vedic Maths web sites: www.vedicmaths.org, www.vedicmaths.com and www.vmacademy.com have been merged into a single site. All three sites will now point to the same content, which will actually be located on the www.vedicmaths.org web site as this has long been the number one website on Vedic Mathematics. All the material in the original sites are now found in one place and you should be able to find information of any aspect of Vedic Maths including history and origins, newsletter, articles, tutorials, correspondence courses, books, calendar of events and so on. Currently we have just had the time to merge the contents of the web sites and will be updating the contents of various pages over time. We have done this because of a suggestion made to us (that it was confusing to visitors to have to visit three web sites to see all of our material, even though it obeyed web etiquette for separating commercial and non commercial web sites). So please take a look at this and send us your comments. Constructive suggestions are very likely to be incorporated into future updates to the web site. If nothing else, we will gain an insight into what you, the users of our web site consider important. Also let us know if you find anything missing or any broken links. Please remember that we cannot list you as a school or organisation using Vedic Mathematics or as a teacher of Vedic Mathematics, if we do not know you exist. Please send your comments to to make sure that we get them. We are aware that we may have been missing some email sent to us and will be rectifying this situation shortly. The original web pages will remain present for a while whilst we check everything is OK with the updated web site, but eventually they will be removed. So if you have made any links to our web site they will need to be updated, although we do plan to catch all accesses to our site that do not access a real page. This new book by Rajeshwari M. Sharma is a compilation from "Vedic Mathematics" by Sri Bharati Krishna Thirthaji Maharaj. This has been simplified in order to help school children shed their fear of maths and recreate a fascination for the Magic of Numbers in their young minds. It is published by Motilal Banarsidass (paperback) and has 77 pages (Rs. 70). The correspondence course (Course 1) available through the Vedic Mathematics Academy (see www.vedicmaths.org) has now been extended and improved. Students currently taking the course will be automatically transferred to the new one. I am glad to inform you that I am conducting weekly classes (every Saturday) for children aged between 8 to 13 years in Vedic Maths in Mumbai. I started teaching them simple mental calculations where I keep firing questions on additions and subtractions, doubling , repeated doubling, halving, etc., based on sutra' By addition and by Subtraction' and 'By completion and non-completion' etc. They are enjoying themselves so much that they beg me to give them big numbers like 5 ,6 digit numbers to add and subtract or even double. It is a small group and every child is given a chance to answer. At the end of every session I give them a small puzzle to solve at home. A small worksheet with problems covering previous sessions topics is given every time with time limit. They enthusiastically solve them. One parent told me that wait eagerly every week for 'the vedic day' which they call Saturdays now. I am really grateful and happy for the enthusiasm shown by these children. I have started this on an experimental basis covering about 12 sessions of 1 and 1/2 hours each covering about 3 months. Many more enquiries have come for the same. There are encouraging enquiries from parents also. I am going to Rajkot on 23rd September for a 3 day's workshop. I shall give a report after the workshop. My Vedic Maths classes are going very well. The parents of a few children expressed the wish that they would like me to extend the sessions beyond 12 weeks. The children themselves told me that their speed has improved after the mental excercises we had every week, and they could save about 10 to 15 minutes during their exams easily. This gave them time to check their answers. This I feel is a very good sign that vedic maths is really a very useful tool and at the same time beneficial to the children. They have become more confident and are not afraid or hesitant now to face mental calculations. I am planning to start a similar course at Borivli, for The Indian Planetary Society. This will be at two different levels. The level I is for students between age 9 to 13. The next level for children 14 onwards. This I am planning to start from November onwards. I hope many would enrol for the same. Many teachers are also interested in these methods. My trip to Rajkot, Gujarat was a great success. I went there as an invitee of the Rotary club of Greater Rajkot. There were 2 sessions, one for students of std. 5 to 7 and another for std 8 and above. Many were from college level and a few post graduate students also. Both had about 80 participants in each session. I had myself requested them to restrict the number, since I wanted to reach out properly to each one of them. The workshop was for 3 days each. The children were very enthusiastic and were ready with the answers very fast. The seniors were very happy because now they can appear for any competitive exams confidently. They evinced a desire to have more such sessions.